All aspects of wedding style are subject to seasonal trends, and bridesmaid dresses are no exception. As winter winds down and the Spring 2015 season approaches, many brides are looking to the world of fashion to help dictate their choices for attendant looks. The list below highlights five hot trends for bridesmaid gowns, guaranteed to make your best friends look amazing as they accompany you down the aisle on your big day. Gone are the long skirts and more formal looks of past seasons. Spring 2015 welcomes bridesmaid dresses that have a touch of party atmosphere in their short hemlines. Many hot gowns this year are hitting at the knee and are often supported by voluminous petticoats for a truly festive effect. The style works best in all wedding settings as it translates well from outdoor weddings to traditional chapel setting. Some brides opt to wear their mother or grandmother’s wedding dress, but this spring you’ll see bridesmaids rocking the vintage look too. Many new gowns on the market this season feature vintage-inspired details like lace overlays, muted colors, and embroidered details that hearken back to a bygone era. The beauty of this look is the sense of charm and heritage it lends to any event. Always popular in the spring, shades of purple like violet, orchid, and lavender are back again in Spring 2015. New, vibrant purple bridesmaid dresses are hitting the runways and House of Brides’ inventory right now, including some that are uniquely iridescent, shot with strands of silver. Another trending twist on the purple theme is a decorous blend of purple and gray, which can look almost Victorian when mixed with the vintage trend mentioned in #2 above, yet still manages to be fresh and spring like. Who says bridesmaid dresses have to be a solid color? Usher in the spring with this up-and-coming trend that brings us printed florals on gowns that are still festive and wedding-appropriate. Today’s prints are bold yet playful, and allow you to incorporate even more colors into your attendants’ outfits. Strapless gowns have been the prevailing trend in wedding gowns, but this spring the look has made its way to bridesmaids. The look can be Red Carpet formal to beachy casual. For attendants worried about having the proper support, fear not: today’s strapless gowns are cleverly designed that they can hold you up and still be absolutely comfortable all night long. If you’re planning a wedding for Spring 2015, the trends listed above should give you an excellent starting point when it comes to choosing your bridesmaids’ gowns. Keep these hot new trends in mind when choosing a look that is both fresh and flattering. 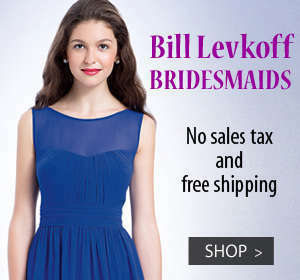 Shop House of Brides online to find dresses in these styles and many more. 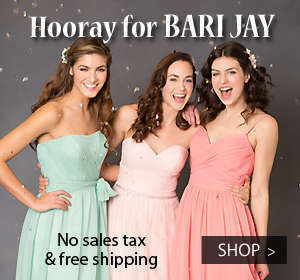 Designer Bridesmaid Dresses from designers like Allure Bridesmaids, Bill Levkoff, Bari Jay, DaVinci Bridals, Liz Fields and many more with savings between 20%-80% off retail prices. Shop House of Brides Online Now!